The Department of Defense has strict rules about how members of the U.S. military can participate in politics. 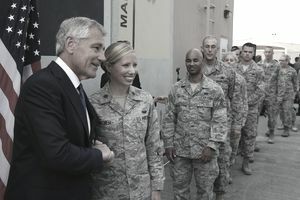 The rules are meant to prevent any appearance of bias or partisanship among the military, whose members must follow the directives of its civilian Commander in Chief and Congress, regardless of their personal affiliations. So what do these rules cover? Here's an overview with some of the key passages from the DoD's own rulebook. The Department of Defense (DoD) defines "partisan political activity" as "activity supporting or relating to candidates representing, or issues specifically identified with, national or State political parties and associated or ancillary organizations." A nonpartisan political activity is defined as "activity supporting or relating to candidates not representing, or issues not specifically identified with, national or State political parties and associated or ancillary organizations. Issues relating to constitutional amendments, referendums, approval of municipal ordinances, and others of similar character are not considered as specifically being identified with national or State political parties." The military wants its personnel to participate in our democratic process, just within limits. The DoD encourages active duty military members to vote and has established several programs to help active duty personnel register and cast absentee ballots. But when it comes to actively campaigning for a specific political candidate or partisan objective, the military draws the line. While active military members can and should register to vote and cast votes, and may express a personal opinion on political candidates and issues, they can't express opinions on behalf of or as a representative of the U.S. military. Military members also may promote and encourage other military members to vote as long as they're not attempting to interfere with or affect the outcome of an election. They're also allowed to join political clubs and attend its meetings as long as they're not in uniform. If they want to serve as an election official, military members are allowed to do so as long as they're not in their military uniform and it doesn't interfere with their military duties. The member will need to get approval from the secretary of his or her service for such activity; so soldiers would have to receive the OK from the Secretary of the Army, sailors would need the approval of the Secretary of the Navy, and so on. Active-duty military members can sign a petition for specific legislative action or a petition to place a candidate's name on an official election ballot if the signing does not obligate the member to engage in partisan political activity. This action can be taken only when it is done as a private citizen and not as a representative of the military. A member of the military is also allowed to write a letter to the editor of a newspaper expressing his or her personal views on public issues or political candidates as long as the action is not part of a political letter-writing campaign for a candidate or political action. However, if the letter identifies the member as on active duty (or if the member is otherwise reasonably identifiable as a member of the Armed Forces), it must clearly state that the views expressed are those of the individual and not those of the Department of Defense. Like any other American citizen, military members are allowed to make monetary contributions to a political organization, party, or political committee as long as they're within legal guidelines. Political bumper stickers on a military members' personal vehicle are allowed, but large banners or signs are not. Such banners or posters are not allowed to be displayed at the military member's residence, either. Military members can attend rallies or fundraising activities as long as they're not in uniform and not creating the appearance of any military sponsorship or approval. But they can't speak before a partisan political gathering, including any gathering that promotes a partisan political party, candidate, or cause, participate in any radio, television, or other program or group discussion as an advocate for or against a partisan political party, candidate, or cause, or conduct a political opinion survey under the auspices of a partisan political club or group or distribute partisan political literature. They're also barred from marching or riding in political or partisan parades, and can't engage in political fundraising activities while on federal property. In addition, they cannot participate in any organized effort to drive voters to the polls on election day if that effort is associated with a partisan political party, cause, or candidate. In general, active duty military members should avoid any activity that may be reasonably viewed as directly or indirectly associating the Department of Defense or the Department of Homeland Security with partisan political activity. Active duty military members may not hold civil office in the federal government if the office requires an appointment by the President by and with the advice and consent of the Senate. This prohibition does not apply to retired and reserve members who have been called to active duty for a period of 270 days or less, as long as the office does not interfere with military duties. If the retired or reserve member receives orders indicating his or her active duty recall will be for more than 270 days, the prohibition begins on day one of active duty. Any enlisted member or officer may seek, hold, and exercise the functions of nonpartisan civil office as a notary public or member of a school board, neighborhood planning commission, or similar local agency, provided that the office is held in a non-military capacity and there is no interference with the performance of military duties. This same caveats about retired and reserve members as mentioned above apply to these local offices. When circumstances warrant, the appropriate secretary or a designee may permit a member covered by the prohibition against holding public office to remain or become a nominee or a candidate for civil office. What that means is that if a Congressman, retired from the military were recalled to active duty for more than 270 days, the Secretary of the service could allow them to retain their public office (or, even become a candidate for re-election). What is the drinking age on military bases? Is There a Statue of Limitations for Military Offenses? What Is a Basic Allowance for Housing (BAH)?